In the spirit of Easter, I thought I would cook up a festive, rather than favorite, dessert. What I really like about this recipe is the meaning behind it, and for some reason, I like cutesy looking desserts. (I made reindeer chocolate chip cookies for Christmas). The reason this dessert is festive, a.k.a celebratory, is because Resurrection Day is remembered as a joyous occasion, despite the fact that Jesus’ self-sacrifice was grueling and bloody. Without it, there would be no salvation. Jesus is known as the “Lamb of God,” as a result of John the Baptist’s procla- mation, “Behold the Lamb of God who takes away the sin of the world (John 1:29),” hence the relevance of the following recipe: Little Lamb Cupcakes. Don’t worry. There’s no actual lamb meat. I also added substitution suggestions if you want to make the recipe easier and more cost efficient. Preheat oven to 350 degrees F. Line two 12-cup cupcake tins with paper liners. To avoid cupcakes sticking if they overflow slightly, lightly spray the tops of the pans.) Put tins on a baking sheet. Set aside. Process sugar and butter in a good processor until very creamy, scraping sides as need, 1 to 2 minutes. Add the eggs and yolks, one at a time, pulsing after each addition. Add the milk, water, and vanilla and process to blend. Whisk both flours, baking powder, and salt in a medium bowl. Add the dry ingredients, in 3 batches to the wet, pulsing, and then scraping batter of the sides of the processor as needed after each addition. Process until the batter is very smooth and pourable like pancake batter. About two minutes. Evenly pour the batter into the prepared cups, filling them 3/4 of the way full. Bake until the cakes are just firm and spring back when gently pressed, and the tops are golden. 18 to 25 min- utes. Cool slightly in tin, and turn out of tin when cool enough to handle. Cool cupcakes completely on a rack before frosting. Frost cupcake. Place the large marsh- mallow in the center. Lightly frost candy eyes and press onto the marshmallow. Frost the back of the jujube candy and put below eyes to for a nose. Frost the short piece of licorice lightly and press underneath the nose to make the mouth. 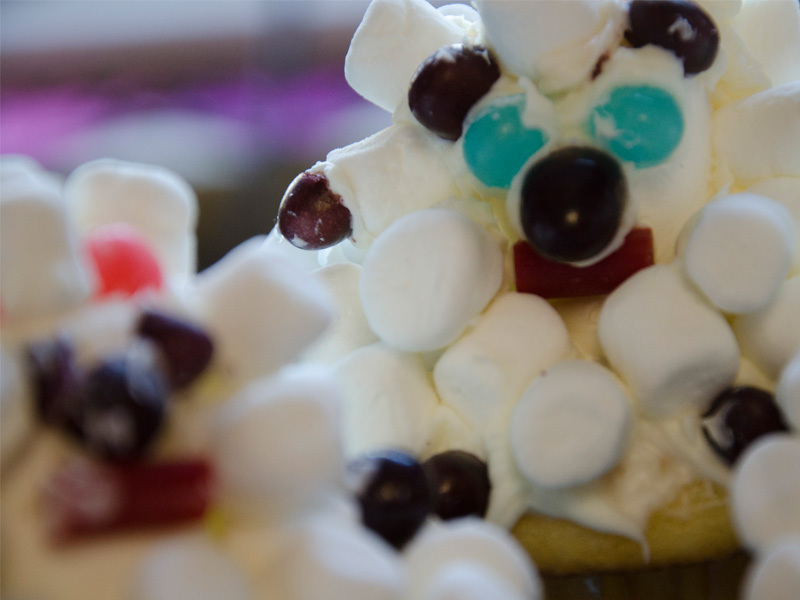 Press mini-marshmallows all around the cupcakes and the face to make the lambs coat. Frost the tips of the pink jelly beans to make ears. Stick the purple jelly beans in the front and back of the cupcake for feet. Curl the long piece of licorice and press into frosting to make the lamb’s tail.